The lone owner-driver in the field stole the pole for the 97th Indianapolis 500. Ed Carpenter emerged from the "Fast Nine" ahead of the five Andretti Autosport and three Penske Racing entries. Rain delayed Saturday's Pole Day qualifying and limited Fast Nine teams to just one attempt at the first starting spot for the historic race. One attempt was all Carpenter needed to win the Verizon P1 Award, scoring 15 IZOD IndyCar Series championship points and a bonus of $100,000. Rookie Carlos Munoz and Marco Andretti fill out the front row, both driving for Andretti Autosport. E.J. Viso (Andretti), AJ Allmendinger (Penske) and Will Power (Penske) line up on the second row with Ryan Hunter-Reay (Andretti), Helio Castroneves (Penske) and James Hinchcliffe (Andretti) finishing out the top nine. The first owner-driver to win the pole since the legendary AJ Foyt did it in 1975, Carpenter is also the first American driver to do so since Sam Hornish Jr. in 2006. Munoz became the youngest driver in race history to qualify on the front row, and the first rookie since fellow Colombian Juan Pablo Montoya in 2000. The young Andretti Autosport driver has been on the pole for all three Firestone Indy Lights Series races this season and won two of them. Fourteen other drivers qualified for the 97th running of the 500. On Sunday, Old National Armed Forces Bump Day allows the remaining nine drivers to attempt to qualify for the 32-car field. Only one will go home. 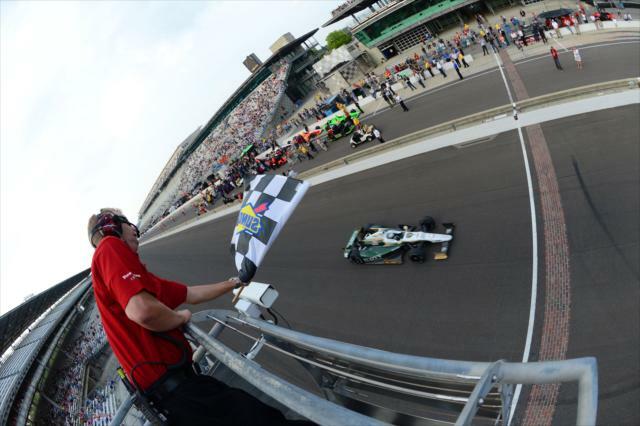 The 2013 Indy 500 is scheduled for Sunday, May 26, and will be broadcast on ABC.